Rainforest walks are at your back door, spotlighting at night is a feature, while native pademelons, tree kangaroos and wallabies feed at your feet. The panoramic views, as you relax or entertain, are stunning. There are three bedrooms - the "Bandicoot", "Pademelon" & "Wallaby" rooms, all of which have private ensuites & TV's. The rooms are configured with king beds that can be split for twin share. The Pademelon & Wallaby bedrooms, have an ensuite with two rooms, a king + 2 singles - each BR suitable for 4.An extra pp charge on top of the normal one room charge is applicable for the Pademelon & Wallaby rooms. Small reading library of Australian classics in the lounge area with Bay windows, is a feature. Packages, for all of the above, can be supplied. 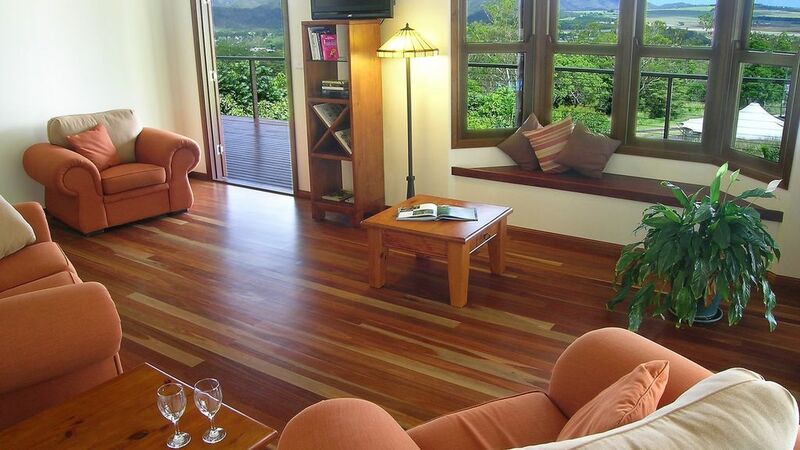 "Opened", August 2008, our new establishment, The Summit B&B (a separate construction to The Summit Rainforest Retreat), is available to be booked. Built in the classic "Queenslander" style, with all rooms having access to a wide inviting deck, through French doors, it is self contained and "non hosted". The Summit B&B can be booked on a B&B room basis, or as an entire house (sleeps 10). The facilities include a sparkling pool with waterfall feature, 3 ensuited bedrooms, full kitchen & coin operated laundromat, panoramic views, centrally heated and cooled, Digital TV in all bedrooms and a beautiful lounge area with bay windows. Situated next to an Environmental Park and surrounded by Mabi Rainforest, privacy from neighbours is assured and native wildlife abounds. Very nice home, but too many locks to get into rooms, did not have enough cooking pots and pans. No air conditioners in the bed rooms. Went to use the washing machine and the cleaners are using them. You have to go to the owners house to pick up the keys, they do not meet you there. Beautiful, Relaxing, and spacious. I highly recommend this place to any one wanting a place that is away from the hustle and busle, but with convenience at your door step. Hidden away up a beautiful drive away you arrive on the door step and total relaxation, With everything supplied all you need is your bag, a bottle of nice wine and some cheese and crackers. My family and I stayed her for my sister's wedding and I could not have picked a more inviting and comfortable home to stay at. I will defiantly be staying here again. The whole process from start to finish was made easy and welcoming from both Owners.